This terse notice to Burleigh County suckers taxpayers was posted on the Burleigh County website but flew mostly under the radar. If you read it, you’re about to get socked by another expensive sucker-punch by commissioners Jim Peluso, Doug Schonert, Brian Bitner, and Jerry Woodcox. I left Mark Armstrong off that list because he’s the one through whom I actually learned of this nonsense. Here’s the obscure listing of the notice, which doesn’t even appear as plain text (just a PDF file). What in the world does that even mean? Well, apparently that’s all the explanation we’re going to get about this tax hike. 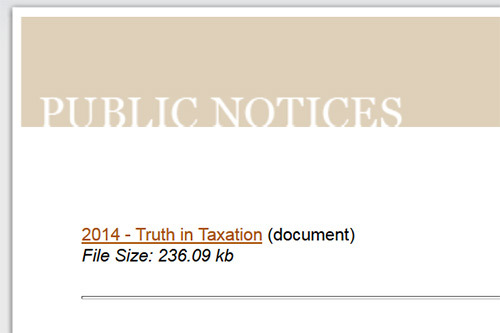 By the way, what do other Public Notices look like on their website? They’re posted nearly in their entirety. Remember that Sesame Street jingle, “One of these things is not like the other”? Start singing it now. And then grab your ankles, because it’s clear that the Burleigh County Commission does NOT want you to know about this until it’s too late. Well, you’ve been warned. Show up at 6pm tomorrow and make your voice heard. This entry was posted in Expository, Government by Clint. Bookmark the permalink.